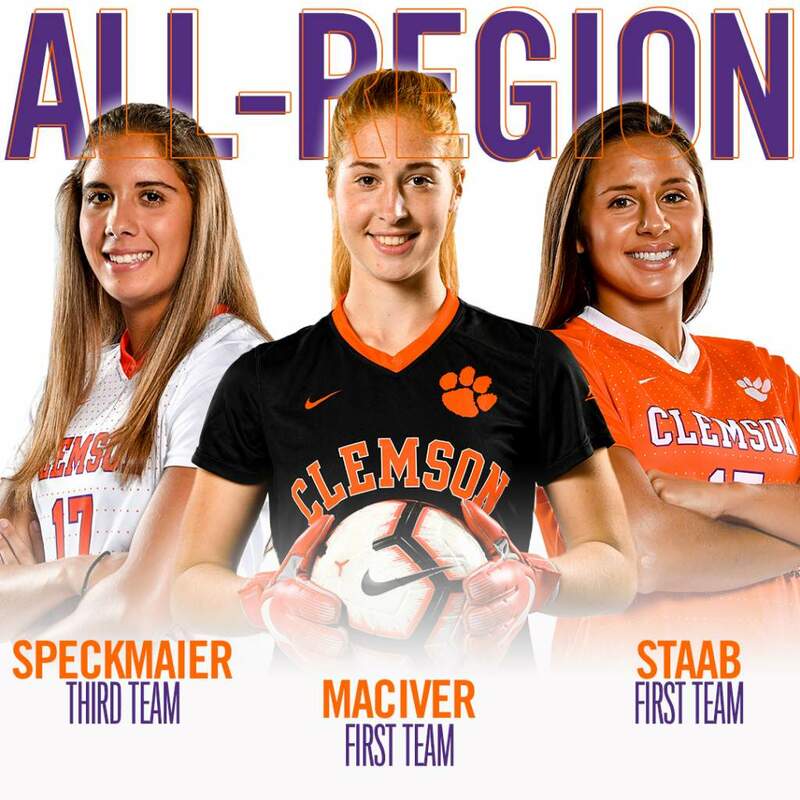 CLEMSON, S.C. – Senior defender Sam Staab was named to the 2018 United Soccer Coaches Division I All-America Third Team as announced by the United Soccer Coaches on Thursday. Earlier this week, Staab, along with junior Sandy MacIver and sophomore Mariana Speckmaier were named to the United Soccer Coaches All-Atlantic Region Team. This is Staab’s first career United Soccer Coaches All-America honor, and the All-Atlantic Region First Team was also the first of her career, as she was named to the All-Region Second Team in 2016. The Tigers, who finished the 2018 campaign with 12 wins and the program’s fifth consecutive berth in the NCAA Tournament, were led by Staab, also the 2018 ACC Defensive Player of the Year. The San Diego, Calif. native finished her season third on the team in scoring with 13 points, on one goal and 11 assists, tying her season high in assists. Staab finished her career at Clemson playing in 7,360 minutes in 80 matches, and scoring five goals while assisting on 33. The 33 assists put the center back in fourth place in school history in career assists. Additionally, she was named to the United Soccer Coaches 2018 Scholar All-South Region First Team after maintaining 3.60 GPA during her four-year career as a Tiger. MacIver also earned All-Atlantic Region First Team honors and earlier this fall, earned her first career All-ACC accolade as she was named to the all-conference third team. MacIver concluded the season with 52 saves and a .776 save percentage, with just 15 goals allowed for a 0.87 goals against average. The native of Winsford, England missed the first four matches of the season as she was competing with England’s National Team in the FIFA U20 Women’s World Cup in France, making history as the Lionesses claimed the bronze medal with a win in penalty kicks over France. MacIver also was awarded the Adidas Golden Glove award for her outstanding performance in goal as she started all six matches for England and compiled 38 saves. Speckmaier was named to the All-Atlantic Region Third Team by United Soccer Coaches. The product of Miami, Fla., who earned All-ACC Second Team honors this season, led the Clemson attack, scoring 10 goals in 20 matches while adding two assists for 22 points. In just two seasons, the sophomore forward has 17 goals and five assists for 39 points with a shots on goal percentage of .506. She leads the conference in game-winning goals this season with six, and is tied for third in total goals.